The following is a review of a workshop I attended at the March 2013 Society for Applied Anthropology conference on Text Analysis (i.e., the interpretation of data from things like transcripts, books, diaries, emails, artifacts, images, events, and basically any other object or observation of human behavior and creation). The workshop was put on by anthropologists Lance Gravlee of the University of Florida and Amber Wutich of Arizona State University. I really have nothing but good things to say about the full-day workshop, which was offered at the bargain price of $95 (including lunch!) Eight hours is a long time to sit and learn about anything, but Drs. Gravlee and Wutich presented a very engaging and informative lecture-style presentation with a number of hands-on opportunities to get more familiar with the techniques they discussed (and the analysis software), and expand one’s perspective on research design. There was something useful for everyone, no matter his or her level of skill with qualitative methods; the workshop was fitting for students, scholars, and professionals who use qualitative methods in their work, as well as professors seeking pedagogical ideas for teaching the approach. And while I do not currently use text analysis software (I do it old school), I know that lots of people do, and it is an important skill of which researchers should know at least the basics (I’ve been asked about my familiarity with data analysis software during interviews before, but never had the chance to learn it in my training). One of the most useful sections for me was the review of text analysis traditions/techniques, which really fleshed out a “typology” of the different types of data/themes to look for during research. Students in anthropology programs (both undergraduate and graduate) typically learn about this sort of thing to some extent. However, in my studies, qualitative methods were reviewed (and definitely read about in case studies/books), but not that deeply delved into from a methodological or training perspective. To digress for a second, I think part of the problem is the lack of teaching resources in academic training programs for devoting time to very in-depth teaching of methods in survey-style courses that have to cover a lot of ground. Even though text analysis is the backbone of a lot of the research we do (qualitative, ethnographic, etc. ), students, at least at my schools, were essentially taught the basics of it, and were sort of just asked to jump in and give it their best shot (to learn by doing). 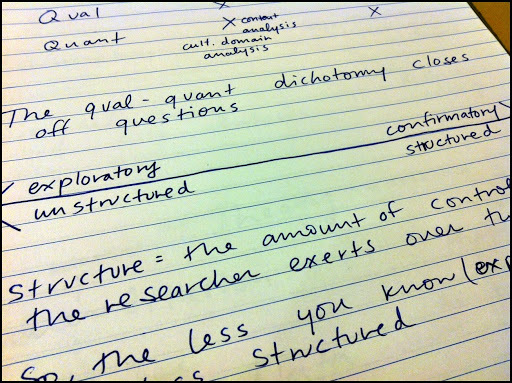 The way I learned to do qualitative/text analysis was mostly through experience and basic instruction in two methods courses. They were fairly similar to each other in that they provided an overview of lots of different approaches to data collection and analysis (focus groups, interviewing, survey questionnaires, ethnographic methods, and related analytical processes), but nothing as in-depth on text analysis as was provided during this workshop. If the workshop is offered again at the 2014 SfAA meetings in Albuquerque, don’t miss your chance! I especially recommend it for students who wish to enhance their qualitative research skills with a foundation of knowledge for the experiential learning that will take place both academically and professionally. I also encourage academic departments to offer stipends if possible. As a fan of continuing education, I am of the belief that it is never too late to learn, and I am confident that the workshop improved not only my methodological tool kit but also the way I think about research. I cannot wait to use what I learned on my next big project. I also would not hesitate to take another methods-focused workshop from this team if it were offered. A bonus: Lance Gravlee and Amber Wutich were both students of Russell Bernard (the veritable godfather of anthropology methods if you ask anyone), and Dr. Wutich is also Associate Editor of Field Methods (a journal on methods in fieldwork). So, it’s a great opportunity for students to learn from some of the most knowledgeable people in the field today.